Tucked in the corner of a parking lot, about 100' from the road, I just barely caught a glance at it while passing. Looped around the block and pulled into the parking lot to get a better look. 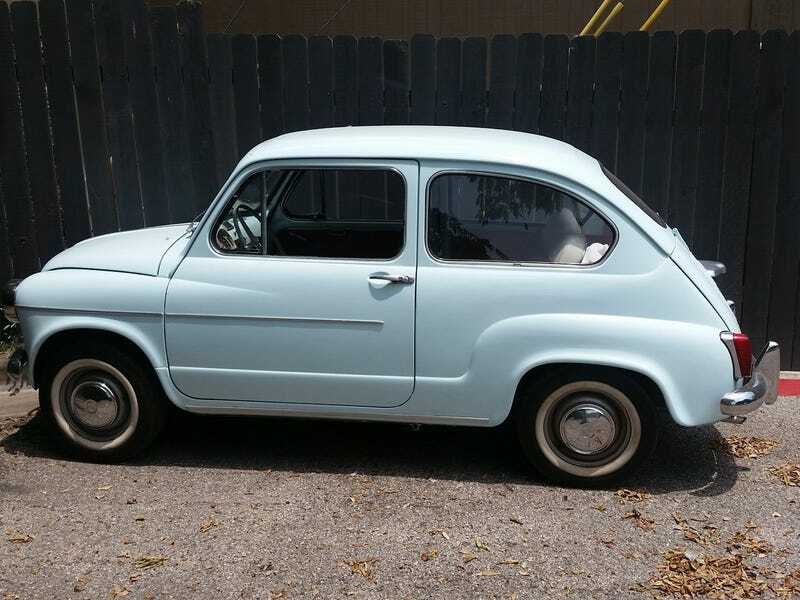 U.S. spec Fiat 600D! I’ve said it before, and will keep saying it, the 600 is a better car in every respect than the 500, but people just do not give it due attention. It can actually seat four, and its water-cooled four cylinder is adequate for moving them as well. The 500 didn’t sell well in the U.S., although Fiat did sell them for a few years during the height of the microcar fad in the U.S. - the 600 on the other hand was available almost until the end of its production life, only disappearing when the 850 became available here for 1968. While fiat didn’t sell many 600s per year, cumulative sales mean they’re relatively easy to find if you’re not picky about which version you want. The late-model 600D being the strongest/most refined, and the early 600 being the quirkier more stylish variant.